Polished fire sits beneath the elegant facade of this natural alabaster chess set, merging chaotic fire with simple refinement. 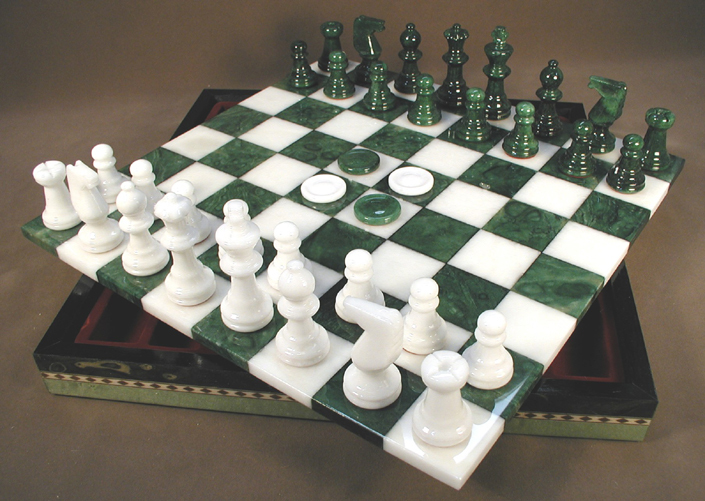 The rosey hands of dawn arise through the surface of this stunning alabaster chess board, and on through the pieces to create a powerful spectacle. The black frame and its subsequent squares are the only retsraint holding back the chaotic amber glow of its lightning laced contrasted counterpart. 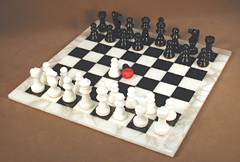 Pure white alabaster is met with its midnight counterpart, to create a chess set in harmony with its own classic style. 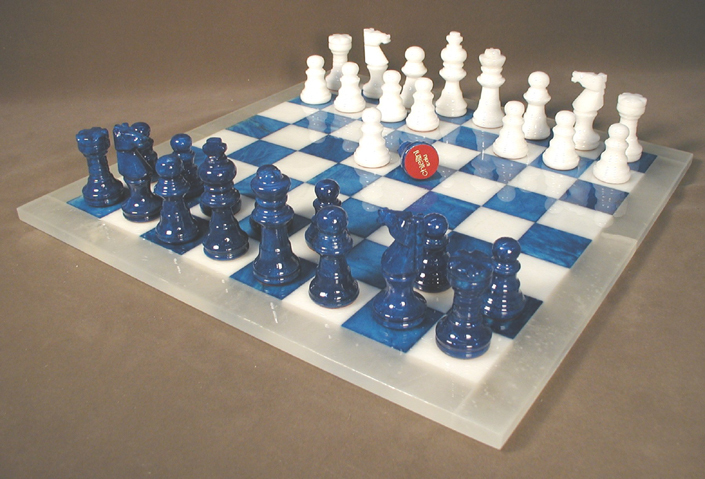 Pure white and tranquil blue contrast across a checkered world, while a hazy white translucent frame is the border to the scene. 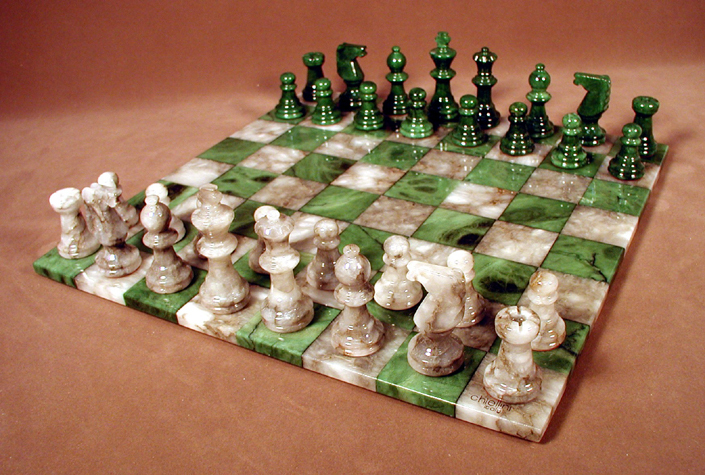 Stunning green hues are met with natural viens and patterns, to give this stunning alabaster a unique personality. Refined, classic, elegant, the simple earth tone colors are matched with darker hues to create a chess set that is rich with power and intent. 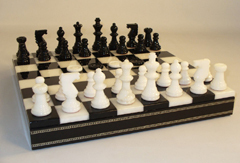 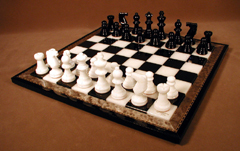 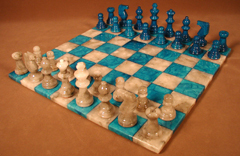 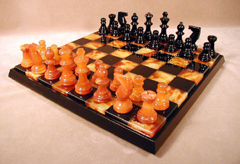 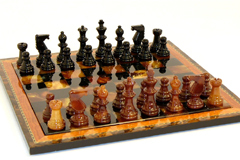 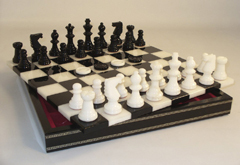 Black and white are the most classic colors used in the manufacture of chess sets. 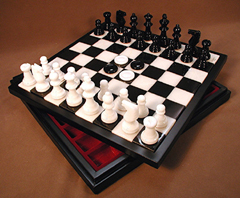 They represent the dichotomy of opposition, the two exact opposites that will meet in match upon the field of battle. This set goes a step beyond the classic elegance, being made from highly polished and refined pieces of natural Alabaster. 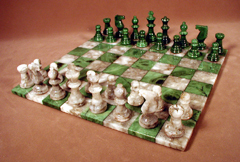 This alabaster is an exquisite material, that gleams in the light, and will almost seem to glow with translucent beauty when illuminated in the right way. 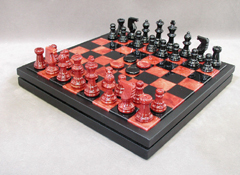 The whole set is built into a wooden frame box, that provides an elegant home for the armies to rest when not in use. 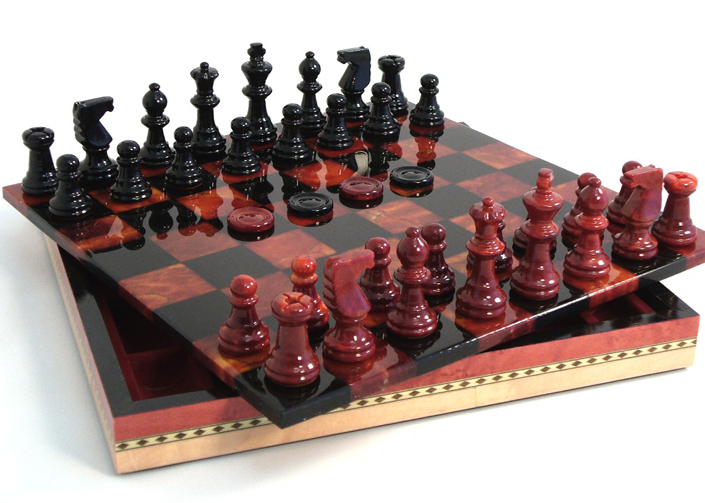 Brilliant red hues emerge in unqiue patterns throughout the squares and pieces of this stunning alabaster chess set. 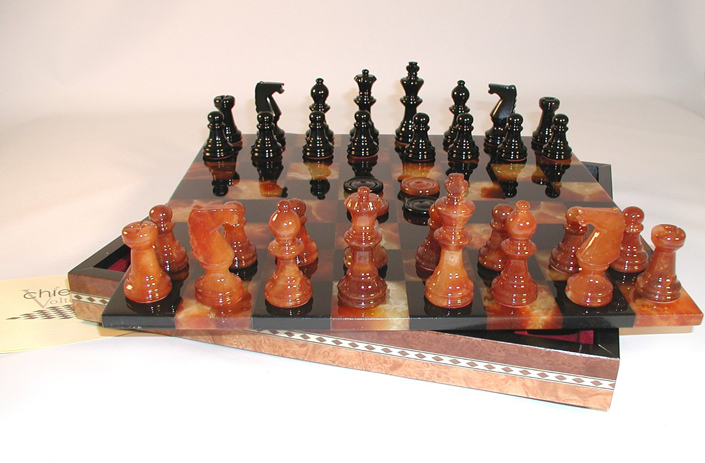 These rosey tones are framed and displayed by their black counterparts, who stand as the order against chaos in the checkered world which the inhabit. 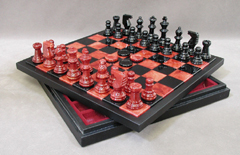 All of this is set into an attractive hardwood frame, which acts both as the base of the set, and provides an elegant and safe place to store the pieces in between matches. 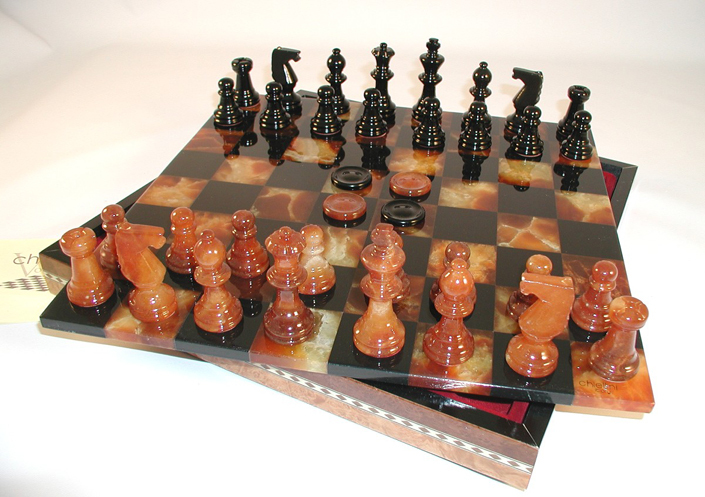 The surface of this lovely stone chess set is a contrasted mix of white lightning laced amber flames, and dark stoic black, which merge and mix to create a powerful and inspiring effect, all buried beneath the refined polished surface of the stone. The delicately polished board sets into a hardwood base, which doubles as a storage container for the beautifully hand crafted standard matched stone chess pieces. The classic beauty of this standard black and white chess set is enhanced by the shimmering beauty of the gorgeous natural alabaster used in its construction. 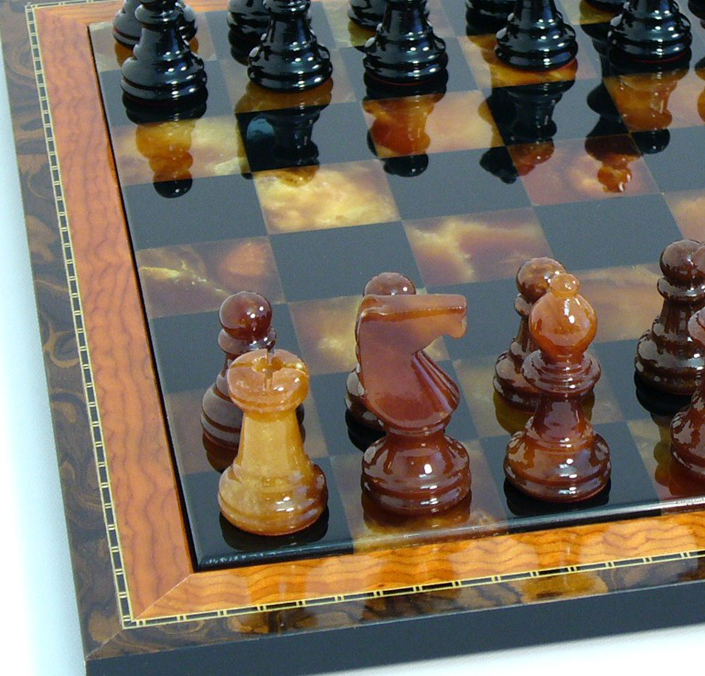 This delicate yet durable material can take an extremely high polish, giving it a sophisticated look that is a step above other sets. The stylish board is set into a hardwood base, which also acts as a protective shell for the matched black and white alabster pieces when you arent using them in a game. 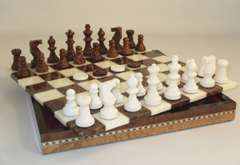 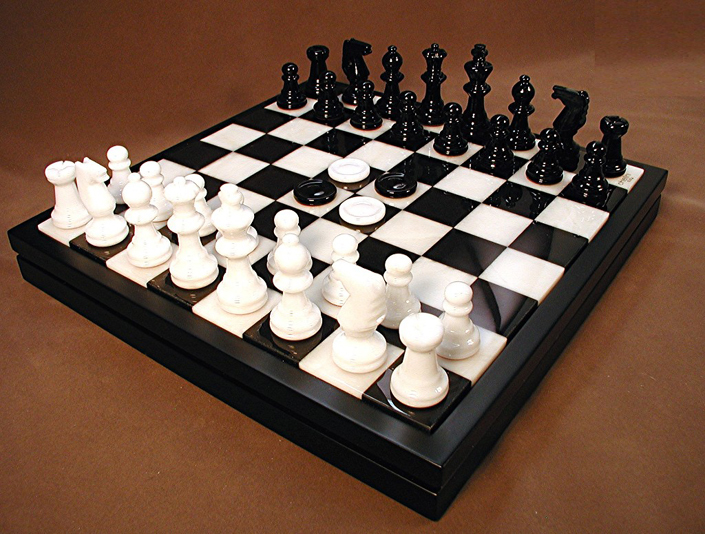 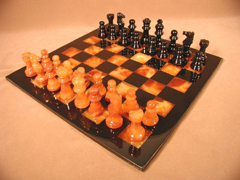 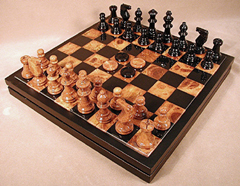 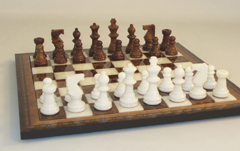 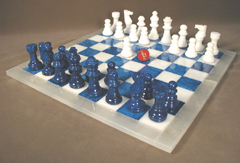 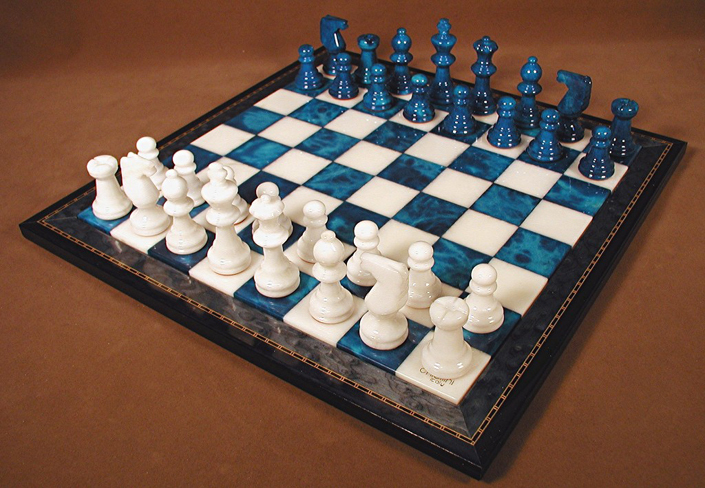 The stunning surface of this high end chess board is made from a solid piece of pure white natural alabaster. 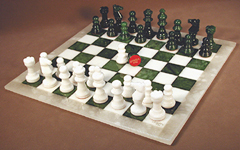 This purity is then broken by precision printing, which adds a colorful tint to the various checkered squares of the board. 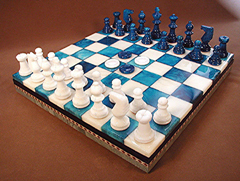 This blue tinting is the color of a tranquil ocean, and it is actually able to pick up the subtle lines and viens found underneath the stones surface. This gives the board a distinct personality. The pieces are made of matched contrasting colors, with each one taking a unique perspective on the stone used. 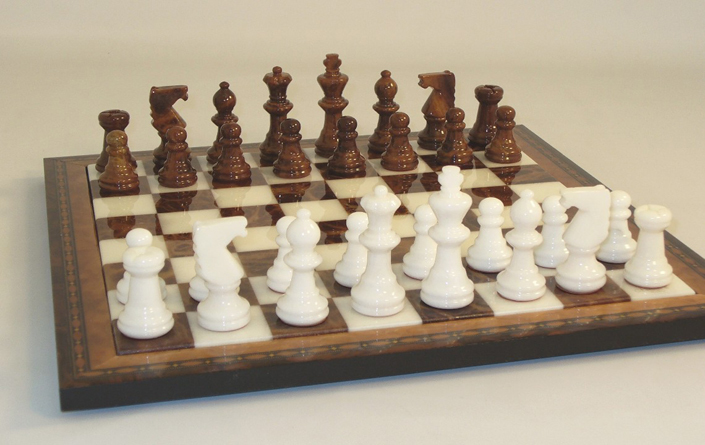 The formal beauty of the earth tone colors, matched against a pure white alabaster surface, creates a powerful and refined effect, which would make this set at home in even the most upscale of corporate offices. 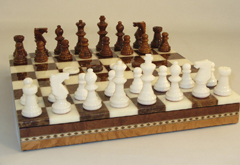 The effect is completed with the carved hardwood frame, which the board rests into, and which can be used to store the pieces away in safety. Gently patterened forrest green sweeps across the pure white surface of these alabaster boards, breaking the perfection with wild powerful colors. 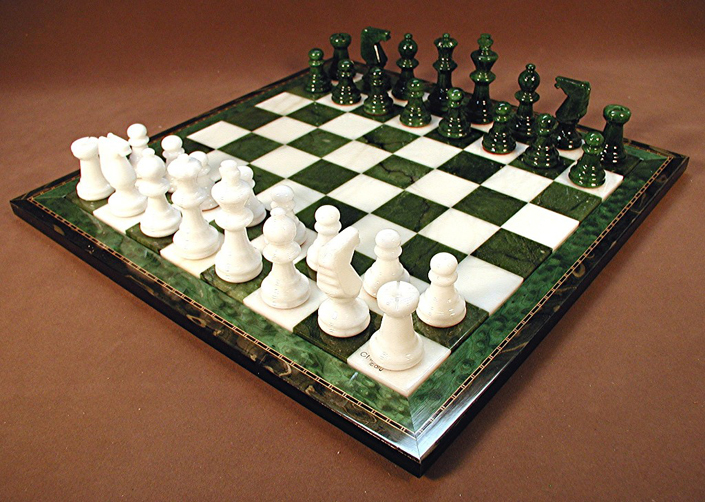 This green invasion rises up through the bodies of one half of the silent stone sentinals that sit atop the world, and this posessing, send forth those fierce combatants to wage war across the square board world. 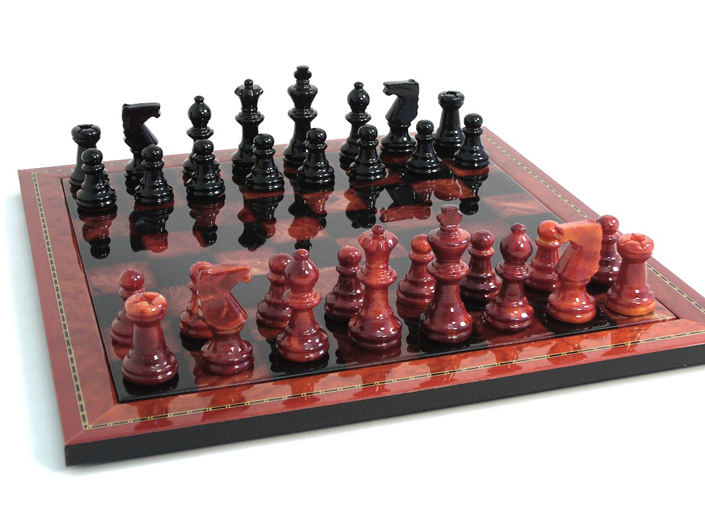 The deep crimson colors, broken by delicate lines of contrasting viened color, are matched with fierce black squares, which serve to give the entire piece a dark and fierce demeanor. It is across the surface of the crimson world that the two armies face, their fierce determination visible plainly in the war like colors which adorn their faces. This chess board is a symphony of distinguished colors, light golds merged with gentle earth tones, and then set against a solid black counterpart, to create an effect which is both refined and chaotic. 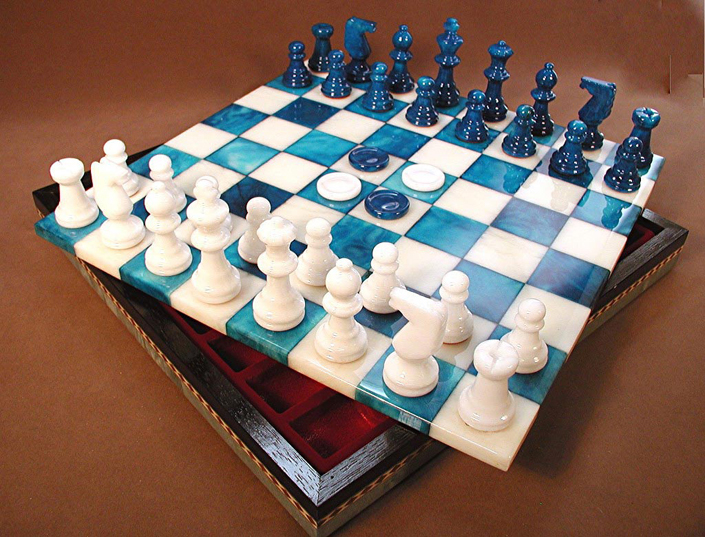 Out of this union is born a chess set with an inspired passion, which instantly stand out wherever it is placed. 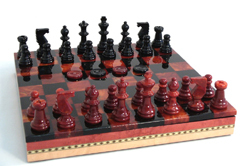 The board itself is framed in a lightly patterend hardwood border, which serves to compliment the colors in the game. 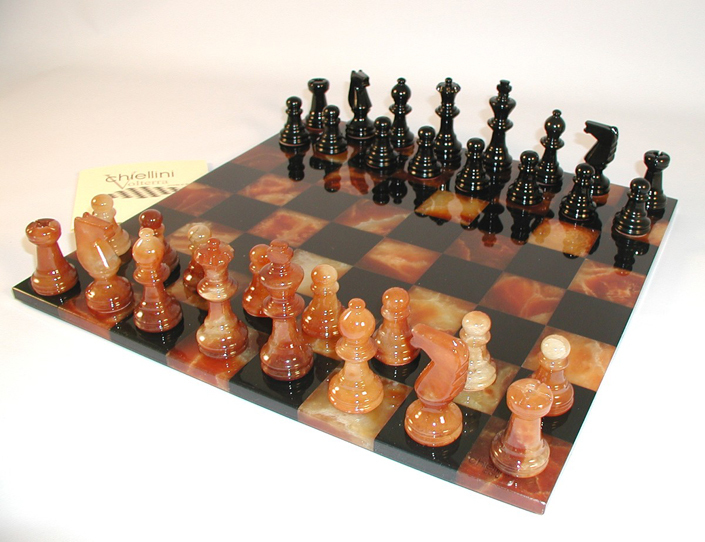 Meanwhile the pieces are a matched set of midnight black and gentle amber hues, which serves to complete the overall effect of sophisticated style and refinement. Tranquil blue tones, like the ocean lapping across the surface of the board, broken by a checkerboard of white which serves to uplift the overall visage of the piece. The union of earth tones and white contrasting squares serves to create a chess set which is elegant, refined, and beautiful. 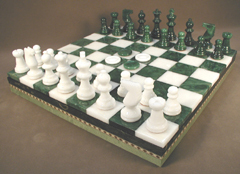 The deep beauty of the green squares is constrained and focused by the purity of the white. 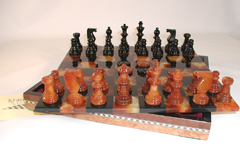 The whole set is then given a festive look with the finely decorated hardwood border frame. 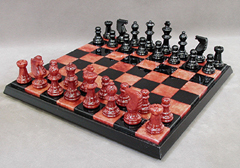 Firece colors merge with hollow black tones, to craete a chess masterpiece that emotes visions of fire, power, and conquering masters. 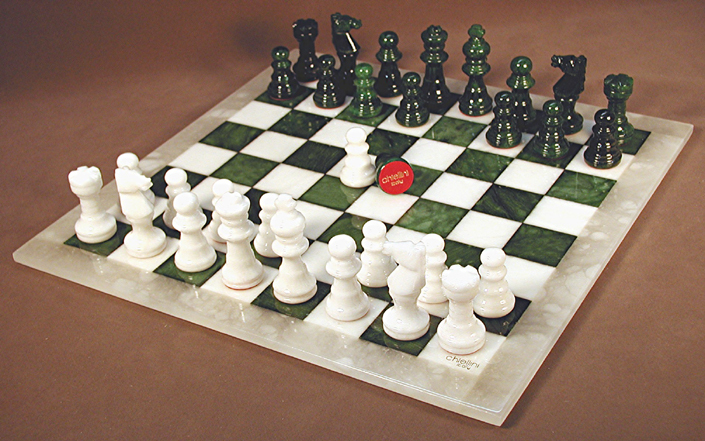 This represents the most pure and simple of the alabaster chess boards, with the simple squares cut straight and true, with only the slightest hint of abevel to refine the sharper edges of the piece. 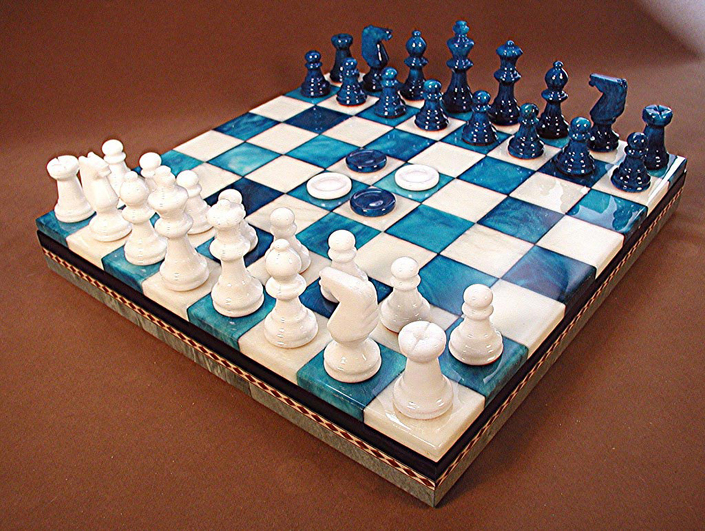 Brilliant blue pastels merge with soft gray over tones, in a work of natural beauty that is matched only by the precise carving of the individual pieces. The mixture of smokey gray tones with granulated greens results in a chess set with a rustic, natural, antiqued look.